GreenSpace Cafe is now open for lunch. 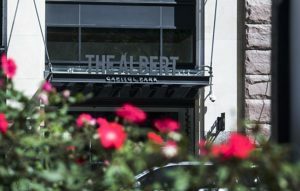 Capitol Park’s the Albert, a luxury apartment building, will help resurrect Detroit’s La Lanterna later this year, with Edoardo Barbieri’s grandson Edward, his wife, Suzie, and sisters Ann Kolinski and Alicia Topolinski prepared to reopen in the same neighborhood where their family opened its first restaurant in 1956. The Albert will bring back La Lanterna later this year. Until they’re open, you can visit one of the family’s three Da Edoardo restaurants, or Cafe Nini in Grosse Pointe. Beyond Juicery + Eatery has a new location in Birmingham’s Rail District (2221 Cole St.). It’s been a busy year for the local health food chain. 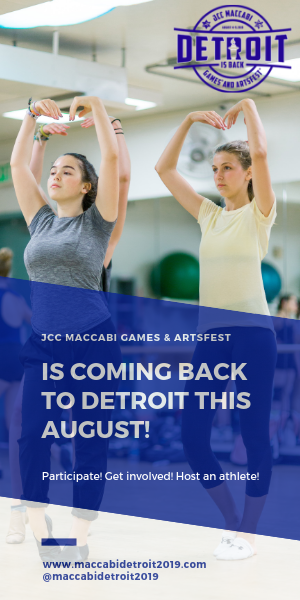 They’ve added locations in Southfield and Troy, and plans are in the works for an Eastern Market location on Russell Street and a Royal Oak location in the Beaumont Hospital lobby. The Cole Street location will serve as an open production facility for its “Beyond Made” sauces, dressings, juices and baked goods. Their full carryout menu is available and delivery is offered in Birmingham, east of Woodward. Speaking of fresh and healthy, Ferndale’s GreenSpace Cafe launched lunch service this week. It runs weekly, Tuesday through Saturday from 11 a.m. until 2 p.m. (215 W. Nine Mile Road). 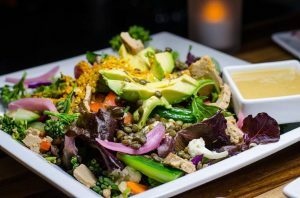 The lunch menu will feature its “vibrant vegan fare, but more casual, and in lunch-sized portions,” per owner Dr. Joel Kahn. Some of the lunch menu features include a tomatillo gazpacho, its signature “superfood salad,” faro lentil burger and a number of small plates — all pair well with their fresh raw juices, conscious cocktails, sustainable wines and Michigan craft beers. 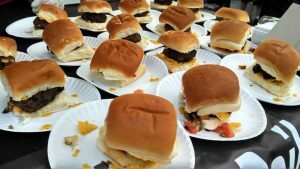 You can sample some of the area’s best burgers and brews this Friday, July 22, at the Third Annual Burger Bash Detroit, inside the Royal Oak Farmers Market. General admission opens at 7:30 p.m. and runs until 11 p.m.; $40 will buy you unlimited food samples and three beverage tickets. For an extra $10, a VIP ticket nets you early entry at 6:30. Every attendee gets a voting card to help name Detroit’s best burger, most unique burger and most flavorful burger from dozens of participating restaurants. There are also awards for best fries, best sweets, and best macaroni and cheese. 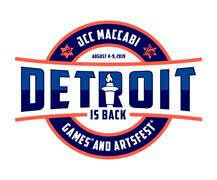 Don’t miss Burger Bash Detroit, July 22 in Royal Oak. Gleaners Food Bank and Crispelli’s Bakery and Pizzeria have partnered to help raise money to feed hungry children. Visit Crispelli’s in Troy (645 E. Big Beaver) through July 29 to make a donation of cash or a nonperishable food item. For every dollar donated, six meals will be provided through a generous dollar match program. For every 3.6 pounds of food donated, they’ll guarantee a full days’ worth of meals for a child in need. Gleaners Summer Food Fight helps target the 300,000 children across Southeast Michigan without access to quality, healthy food options. The two-week community challenge encourages local businesses to compete to collect food and money. The program, sponsored by Citizens Bank, raised more than $40,000 and 27,000 pounds of food last summer. To Jenna Behrmann and Brett Gerber on their wedding. To Michelle Attar and Chris Collichio on their wedding. Happy birthday to Natali Barish, Brittany Borsen, Eric Dermer, Sue Diagnault, Etka Goldberg, Barb Jacobs, Shelby Levin, Jenna Rosen and Jordan Sherman.